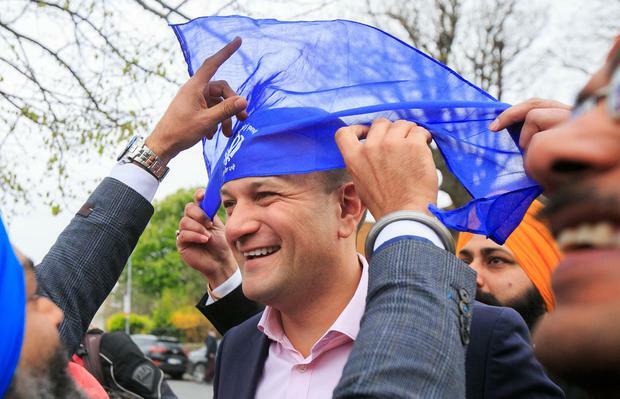 Taoiseach Leo Varadkar had no qualms about wearing his party's colours at a celebration in Dublin marking the Sikh festival of Vaisakhi. While celebrations of the religious festival traditionally take place in northern India, it is also commemorated by Sikhs around the world, including Ireland. Yesterday's ceremony at the Sikh temple (Gurdwara) in Ballsbridge also saw dozens of Hindu and Muslim members of the Indian community attend the event. While there were a multitude of head scarves to choose from, Mr Varadkar, Housing Minister Eoghan Murphy and former Tánaiste Frances Fitzgerald appropriately opted for the bright blue ones. "I am very glad they are blue because it's a Fine Gael colour," Mr Murphy said as he addressed the guests. While a Gurdwara is a place of worship in Sikhism, people of all faiths and backgrounds are welcome to enter the temple. This year also marks the 100th anniversary of the Amritsar massacre, an incident which involved the deaths of 379 Sikhs at the hands of British Indian soldiers during a religious festival. Earlier this week, British Prime Minister Theresa May in the house of Commons described the massacre as a "shameful scar on British-Indian history".